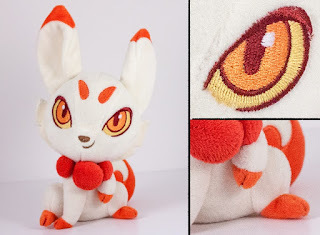 You might remember Sunset Dragons last plush kickstarter for her Little Moon plush. 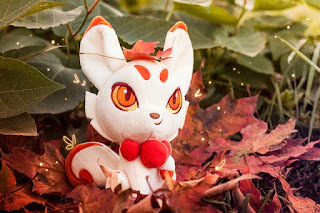 Now she is back with a pair of adorable fox spirits, Kitsune and Otsune. 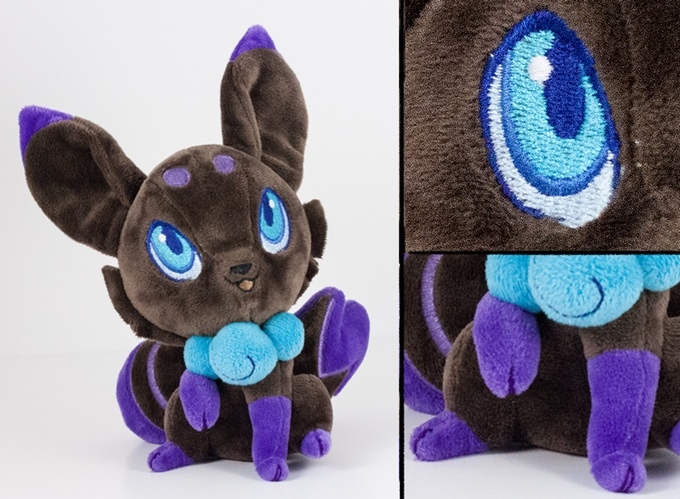 This adorable plush version of Kitsune stands at 8" from the bottom of her rump to the tips of her enormous ears! She is sewn from a super soft pale cream minky fabric and has lovely red minky accents on her paws, tail tips, necklace and the swirl on her tail. She features lovely embroidered eye, eyebrow, nose, paw and mouth details. Kitsune is definitely the fiestier of the two sisters. She loves salty and crunchy snacks- her ultimate favorite food being Ramen! (Kitsune Ramen to be exact!) She's still mastering her shape shifting, so when she's in her human form she keeps a leaf balanced on her head to maintain her concentration. All of the animals in her forest tend to steer clear of Kitsune when she's in a playing pranks mood-which tends to be 99% of the time! This adorable plush version of Otsune stands at 8" from the bottom of her rump to the tips of her enormous ears! 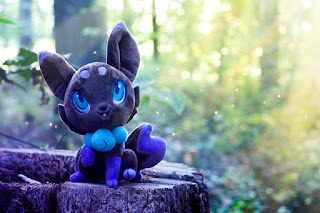 She is sewn from a super soft dark cool gray-brown minky fabric and has lovely blurple minky accents on her paws, tail tips, necklace and the varied designs on her two(!) tails. She features lovely embroidered eye, eyebrow, nose, paw and mouth details. Otsune is the older sister of Kitsune. As a Kitsune of more experience-she even has two tails! She loves desserts and traditional Japanese ones are her favorite-though she would love to travel more and try new treats! Though she's worried to leave Kitsune all alone with no guidance. Otsune is constantly pulling Kitsune out of all kinds of terrible messes. All of the animals in Otsune's forest are also always coming to her with problems that need solving-she's quite loved in her spring woods! There are many tiers of rewards, but $40 will snag you a pair of these foxes on Kickstarter now.